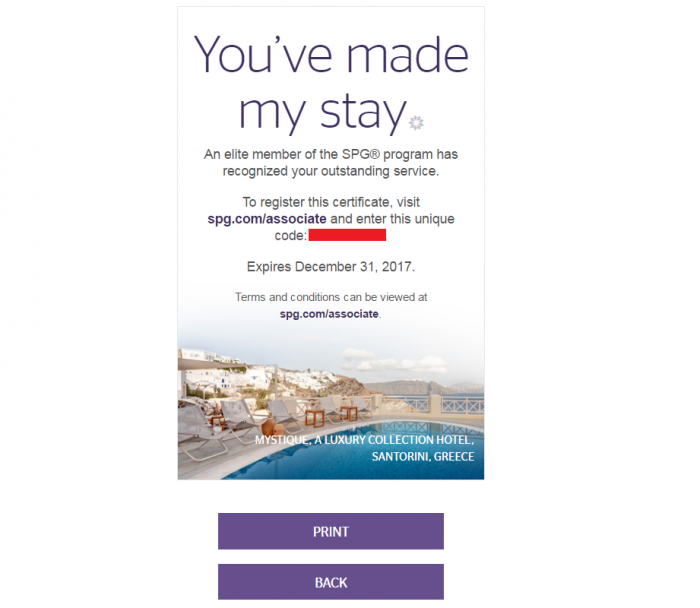 Starwood Preferred Guest (SPG) used to mail with their yearly kit “Elite Thank You” certificates that Gold and Platinum members could give to those associates that go extra mile. These certificates went electronic when those kits were phased out and SPG hasn’t communicated well that these are still available for you to print and give out. You can access SPG web page to request these certificates here. The certificate has an expiry date and a serial number. You can give this number to an agent with whom you communicate over the phone or electronically. Otherwise, you can just hand the printed certificate. The “Elite Thank You” certificates are worth 500 Starpoints each (at least Platinum ones are) to the person that receives them. These are good way to reward those SPG or hotel employees that treat you well, although 500 Starpoints is not a lot. Certificates are nontransferable to other members. Distribution of the certificates to associates is at the discretion of the member holding the certificates; however, the certificates cannot be used as a form of bribery or fraud, nor may the certificates be sold in any manner. The member is not under any obligation to use the certificates. The certificates have no cash value if unused after the expiration date printed on the back of the certificate. No copies or substitutions of the certificates will be accepted. Each certificate includes a unique code that can only be used (and registered) once. Please use by the expiration date on the back of the certificate. The Starwood Preferred Guest® program reserves the right to modify or cancel this recognition promotion at any time. Not responsible for omissions or typographical errors. Void where prohibited by law. To update your communication preferences or learn about our privacy practices, view our Privacy Statement on spg.com/privacy, or call 1-877-782-0071 in the U.S. and Canada or +353-21-4930474 in all other countries. Starpoints, SPG, Preferred Guest, Sheraton, Westin, St. Regis, The Luxury Collection, W, Le Méridien, Tribute Portfolio, Element, Aloft, Four Points and their respective logos are the trademarks of Starwood Hotels & Resorts Worldwide, Inc., or its affiliates. Design Hotels is a trademark of Design Hotels. What is an Elite Thank You certificate? It’s a certificate that an elite member can use to recognize a Starwood associate who provided outstanding service, whether in person or over the phone. How do I get Elite Thank You certificates? Please visit spg.com/elitethankyou to download and print your certificates. Who is eligible to receive an Elite Thank You? All Starwood associates in Customer Contact Centers or hotels that participate in the Starwood Preferred Guest® program are eligible, including but not limited to associates at the front desk, reservations line, concierge desk, bellhop service, restaurants, housekeeping, fitness centers, business centers and so forth. To give a certificate over the phone, just tell the associate you’d like to give him or her an Elite Thank You, then provide the unique code on the certificate. Design Hotels™ employees are not eligible to redeem Elite Thank You certificates. Can I use an Elite Thank You certificate more than once? No. Each Elite Thank You certificate has a unique code that can be used only once, so it can be given to only one person. Can I give multiple Elite Thank You certificates to a single person? Can I get more Thank You certificates? Members are eligible to request certificates when they renew or upgrade their elite status. No additional certificates can be requested. How long are the Elite Thank You certificates valid? Please see your certificates for the expiration date. Unclaimed and unredeemed certificates expire once new certificates are offered. In the event a member reaches a new status, a new set of certificates will be issued and will replace the existing certificates.